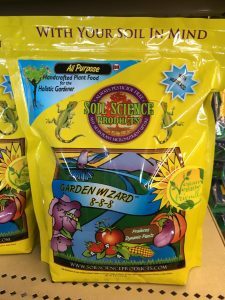 Soil Science fertilizer is “plant food for the Holistic Gardener.” It is an all natural fertilizers that replaces the humic acids in the soil. It is also doesn’t use any animal waste or pesticides, so it is perfect for the conscientious planter. Stop in the store and grab a bag to kick start your garden.